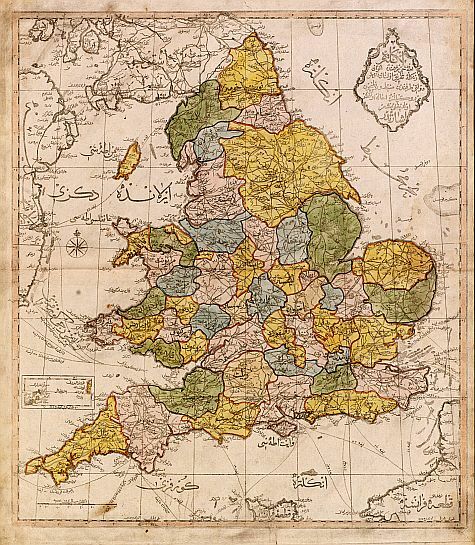 RAIF EFENDI - Map of England. Title : Map of England..
Map maker : RAIF EFENDI. Size : 22.8 x 20.1 inches. / 58.0 x 51.0 cm. Description :Very rare Ottoman printed map of the world in a Mercator projection, centered on Australia. From Jedid Atlas Tercümesi or New Atlas , printed 1218 H. or 1803 in Üsküdar, a part of Istanbul. Title, scale and place names in Ottoman Turkish. Lower right inset of Corsica. The atlas was an annex to a geographical book called Icaletü-Cografya. The author was attached to the Ottoman Embassy in London. The book was written in French by Mahmut Raif Efendi and translated into Ottoman Turkish by Yakovaki Efendi. The atlas is an Ottoman translation of William Faden's atlas. The project was meant to be a prestige project for the Ottoman Palace and it had the seal of approval of the then Sultan-Sultan Selim III. The Plates were made in Vienna. The maps were printed at the Engineer's School Printing Press, which was operating between 1776-1826. The atlas is dated 1803 and according to the reference works only 50 copies were printed., although we think that more copies where printed at the time. The Atlas is the first Muslim-published world atlas based upon European geographic knowledge and cartographic methods. The Library of Congress reports just seven extant copies in Istanbul, and it appears that there are only three others in the U.S.: Library of Congress, the Newberry Library, and the John Carter Brown Library. These are the only known complete copies outside of Turkey. Condition : Paper slightly browned as usual. A dark impression, generally very good.